A batch of red velvet cake mix is a great start to a delicious holiday treat. This page contains recipes using Red Velvet cake mix. 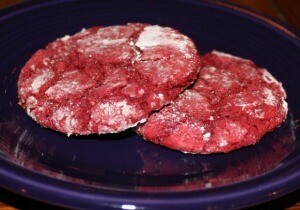 A cookie made from Red Velvet cake mix topped with cream cheese icing. Preheat oven to 350 degrees F. Combine first five ingredients in mixing bowl. Beat butter at medium speed in electric mixer until creamy; 2 minutes. Gradually add sugar, beating well. Add eggs, 1 at a time, beating until blended after each addition. Beat in food coloring and vanilla. Add flour mixture alternately with buttermilk, beginning and ending with flour mixture. Beat at low speed until blended after each addition, stopping to scrape the bowl as needed. Drop dough by 1/4 cupfuls 3 inches apart onto parchment paper-lined baking sheets. Spread dough to 3-inch rounds. Bake for 15 minutes, until tops are set; cool on baking sheets 5 minutes. Remove to wire racks, and cool completely.Crumble 1 cookie into fine crumbs to use as garnish. To make frosting, beat cream cheese, butter, vanilla, and salt at medium speed with an electric mixer for 1 minute, until creamy. Gradually add powdered sugar; beating at low speed 2 minutes or until smooth.Spread about 2 1/2 tablespoons cream cheese frosting onto each cookie; sprinkle with crumbs. Store cookies in refrigerator up to 5 days. These festive cookies are not only delicious, but the kids can help make them. 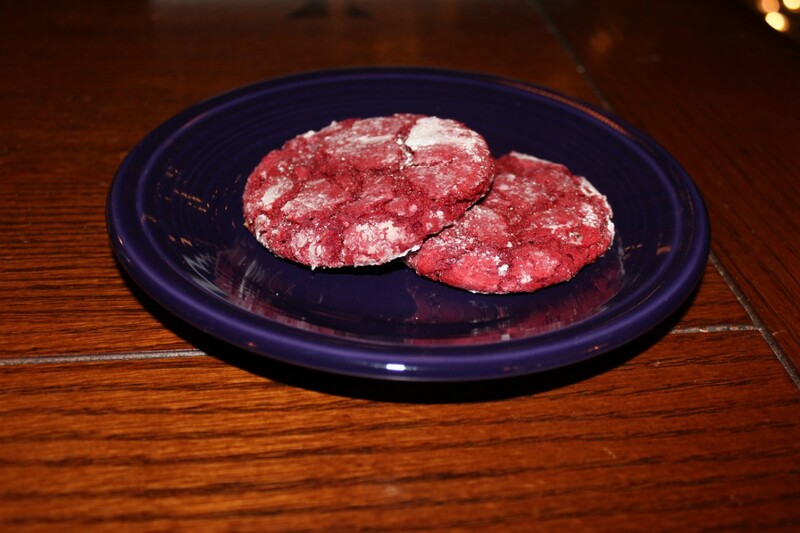 This page contains a recipe for making red velvet peppermint crinkle cookies. Preheat oven to 350 degrees F. Line 9 inch square baking pan with enough foil to overhang sides by 2 inches. Coat with cooking spray. At low speed, beat cake mix, oil, egg and 1/4 cup water until blended. At medium high speed, beat until smooth, about 2 minutes. Stir in chocolate chips. Spread batter in pan. Bake 40 minutes or until toothpick inserted into center comes out clean. Cool 15 minutes. Use foil to lift brownies from pan; cool completely on rack. Remove foil. Spread top with frosting. If desired, decorate. Cut into squares.